Around Town for DC Chanukah 5771! Also available via Facebook; click here to see. Sometimes when I think of familial comedy, my mind automatically jumps to the Focker franchise. The premise of these stories always revolve around outlandish scenarios in order to paint Robert De Niro as the straight man and Ben Stiller as the schlemiel. But in other countries, I’m finding, it’s all a bit more subtle. Tuesday night, I headed to AFI Silver Theater to watch such a movie that was part of the Washington Jewish Film Festival. 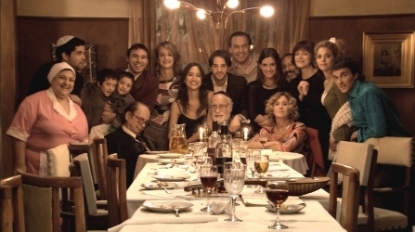 “Judios en el espacio” (Jews in Space), an Argentinian film, relies on character interactions for humor. The crotchety old grandpa who poisons himself has a voice message daring people to leave him a message when he might drop dead before returning it. His estranged daughters talk about one sister’s recent conversion to Orthodoxy—the youngest sister mumbles nonchalantly, “I’d rather have cancer.” Protagonist Tito, a 26 year old man, endures his co-worker’s jibes about “wanting to be related to him” as a way of illuminating their lust for his cousin and all-around object of desire, Luciana. The story begins with a prologue when Tito and Luciana are young children performing in a play that transports the Passover story to outer space. Dressed as Luke Skywalker and playing the part of Moses, Tito freezes on stage. Later that night, he catches Luciana stealing something from his mother’s drawer when they were supposed to be hunting for the afikomen. Sixteen years later, Tito’s lack of assertiveness and Luciana’s kleptomania continue to be main themes of the story, but they don’t overtake the main plot—how the two cousins attempt to create a Passover seder of old for their estranged family and ailing grandfather. It was truly a touching story as well as comedic. 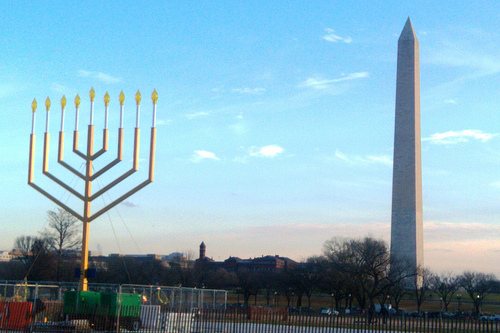 The Washington Jewish Film Festival continues until Dec. 11. Click here for more information. B’nai Tzedek: Why is my Child Acting like That? Hey all! I decided to take an impromptu week off in order to finish another big writing project. 😀 But now it’s the middle of Chanukah! Local Jewish groups are rolling out the red carpet for this well-known religious holiday, which goes on until sundown Dec. 8. Check these out! Family friendly celebration leading up to a premiere screening of Chanukah: The Missing Menorah at JCCGW. Kehilat Shalom party including professional DJ, games, food and more! Young adults aged 18 and up can enjoy Sean Altman’s Jewmonguous concert followed by a post-show party at Sixth & I. Premiere of Chanukah Sesame series with food, crafts and more! Featuring premiere of “Shalom Sesame,” menorah and dreidel making, a latke lounge, face painting, virtual Israel tour and mah jongg for adults, community service and more! Chanukah celebration presented by preschool and religious school. Family themed event featuring music, latkes, jelly doughnuts, arts and crafts and more! NOVA Community Chorus presents Handel’s oratorio Judas Maccabaeus at Bishop Ireton High School. David Smolar presents The Hanukkah Seder, a musical performance to answer all of your Hanukkah questions at Adas Israel. Annual soiree put on by various local Jewish groups. This year held at The Pour House and Hawk and Dove. Monday, Dec. 6, 6 p.m. $5. B’nai Tzedek clergy leads a community Chanukah celebration and menorah lighting at Potomac Village Shopping Center. Israeli dancing for kids and adults followed by a Chanukah treat! Gesher JDS presents The Odd Potato. Wednesday, Dec. 8, 7 p.m.
Encore performance of Handel’s oratorio, this time at NOVA Community Chorus.